The 24 Hours Le Mans is over. Audi wins the 76th edition of the 24 Hours of Le Mans in 2008. The Audi trio consists of Kistensen (wins for the 8th time in 9 tries), McNish and Capello. What has this to do with watches you ask? Besides Steve McQueen wearing his Heuer Monaco in the 1971 movie ‘Le Mans‘, Rolex is long time sponsor of the event. 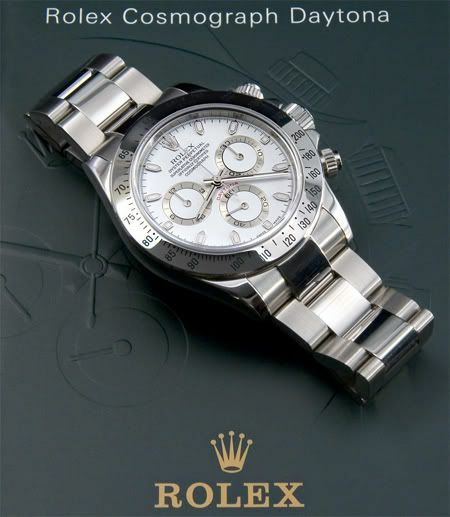 Every year, Rolex presents a stainless steel Rolex Daytona to personalities who embody the spirit of the 24 Hours of Le Mans. This Daytona has ‘Spirit of Le Mans’ engraved in its caseback. Picture by J. Holbrook, from his wallpaper collection @ The Rolex Reference page. This year, the ?¢Ç¨?ìSpirit of Le Mans?¢Ç¨¬ù Rolex Cosmograph Daytonas will be presented to Yves Courage, constructor and driver who has competed in the 24 Hours of Le Mans in 1982 (Lola-BMW), and Martin Birrane, a former 24 Hours of Le Mans driver, who is celebrating his 50th birthday this weekend.